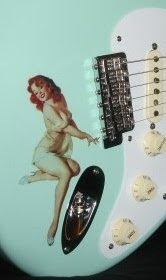 Don Grosh Guitars is a small boutique outfit located in Broomfield, Colorado. This new Don Grosh Retro Classic 2-tone burst weighs in at 7.1 lbs! The 10" radius neck comes with 6150 frets, and they call the profile "Standard Roundback" which could be either a "D" or a fat "C". Gotoh 6-screw vintage style bridge and Grosh's own 60's Fats pickups round this one out. Hard case included.